This full-text Bible in the New International Reader’s Version (NIrV) is for children (especially boys) ages 6-10. Through reading about the “heroes” in the Bible, they will learn what it takes to be a hero of faith both from the character sketches throughout the Bible, as well as the character building feature called “Power Surge—plug it in.” These features will be cross-referenced and will offer the child a “system” for studying the heroes of the Bible, from Genesis through Revelation. Noted artist Dennis Jones has created 40, full page color illustrations which will be spread throughout the Bible. Other features include a presentation page, book introductions, a dictionary, a topical index, several different types of reading plans (theme-based, character-based, chronologically-based, etc. ), and maps (as part of the endsheets). 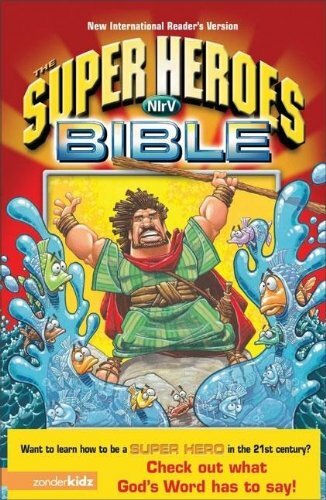 This NIrV full-text Bible for kids ages 6-10 will familiarize readers with the heroes of the Bible and show how they too can become heroes through building their character.